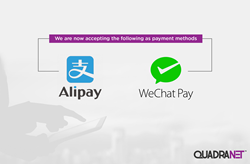 QuadraNet is thrilled to announce the inclusion of Alipay and Tencent WeChat Pay for accepting payment from clients. March 1, 2018 — QuadraNet, Inc. is thrilled to announce the inclusion of Alipay and Tencent WeChat Pay (two new payment gateways) for accepting payment from clients. With the introduction of these two highly productive payment gateways, QuadraNet plans to make the payment process easier for our clients all around the world. When the company was initially formed in 2001, QuadraNet aimed to revolutionize the datacenter industry by providing high-quality service and support to the clients. From Los Angeles to the surrounding areas and the rest of the world, QuadraNet has adapted the evolving customs and expanded its offerings simultaneously. The addition of these two leading payment gateways will make it easier for clients especially originating from China to easily access our services.